Some residents living near Cleveland's Metro Health Medical Center are fed-up with a make-shift smoking lounge set-up in a garage across the street from the hospital. The smoking lounge is used by dozens of Metro Health workers every day and has been located on the West 19 Street alley off of Valentine Avenue for the past nine years. The lounge is inside a garage owned by Victor Montaez and includes milk carton seating, two huge sand-filled ash trays and a posted sign outlining smoker rules and regulations. Residents like Suzanne Davidson believe the impromptu smoking lounge causes Metro Health employees to litter and block the alley. "It's not respectful for the few residents adjacent to the hospital property," said Davidson. "There are 15 to 17 homes affected here." 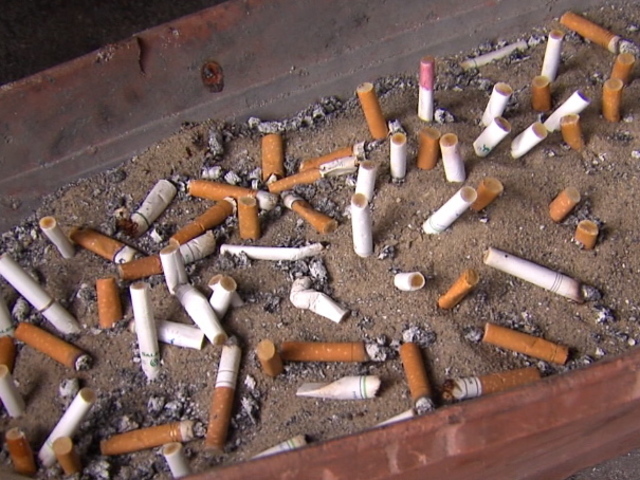 newsnet5.com spoke with the homeowner who explained he was basically forced to set up the smoking lounge in his garage nine years ago because hospital workers kept littering on his property. "I had to clean this every single day nine years ago for seven or eight months," said Montaez. "And I saw that this was going to continue every day and so I allowed it. I said, 'if you want to smoke here you're allowed to smoke in my garage." Cleveland Councilman Brian Cummins said he's been aware of the make-shift smoking lounge and has been in talks with Metro Health Medical Center to see if another location could be found. Metro Health Medical Center responded to our story, explaining the campus ban on smoking was for the health and safety of their patients. Employees hired at the hospital after May 2013 are not permitted to smoke at any time. Davidson had a final message for hospital officials. "I would appreciate if they would set aside an unobtrusive spot for their employees to smoke," said Davidson.